Country bread – although the breads are made quickly all of them are made with attention to detail. 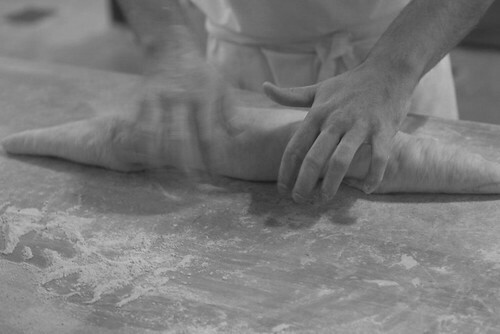 We went to Åpent bakeri (Open bakery) early one morning in order to talk to the bakers and photograph what they were doing. Åpent bakeri delivers bakery products in accordance with tried and true methods, entailing few and small machines, manual labour, and long rest times for the dough, leading to a longer shelf life and more tasty products compared with machine-baked ones. Due to time-consuming and costly work, their products are naturally dearer than conventionally made ones, but as members of Slow Food, we are willing to pay for high quality products. Most of the production takes place in 87, Maridalsveien in Oslo where the work is handled by skilled bakers, among several of who are French. They start working around 1130 pm and it’s full activity all night till about 8 in the morning. Åpent Bakeri was founded in June 1998 by Øyvind Lofthus og Emmanuel Rang in the centre of Oslo. Since they didn’t want to use an electric oven, like everyone else was using, they were looking for wood-fired ovens. Somehow, Øyvind Lofthus found out that a wood-fired oven had been disassembled and stored in a place called Herand in Western Norway. He went to the owner, presented his plans for founding a bakery and said he wanted to buy the oven. Instead, he got it for free and brought it to Oslo. Then, there were no craft bakeries in Oslo and it was a real surprise to the established bakeries that Åpent Bakeri not only survived, but prospered. Having passed 17 years since the foundation, Åpent bakeri has contributed to a a wider selection and a higher quality of bakery products in Norway besides teaching apprentice bakers and confectioners, who have in turn founded their own bakeries and confectioneries. Åpent bakeri sells several thousand breads daily, meaning that the bakers have more than enough to do at night. After all, they shall satisfy all of us who have come to grow fond of their tempting and tasty bakery products, which we can buy at nine cafes at the time of writing in Oslo. Together with their excellent products, it s also possible to buy their book on bread.